Wrestling with tyre levers to fit an inner tube into a cross-ply tyre is not a task that everyone is familiar with, It is one of those jobs when order matters and so a few notes to guide the inexperienced may help. The tube may have a puncture due to a foreign object penetrating the tyre or has lost pressure because it has become porous due to age. Check carefully around the outside of the tyre to see if there is an object eg. 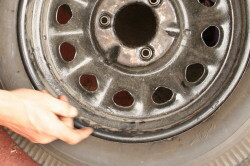 nail, screw or thorn that is the cause of a puncture and chalk mark the tyre. Try and work on a mat or covered surface so as to avoid damage to the wheel rim during the work. Before you start check your tyre levers. Make sure there are no sharp edges which could damage the tube. 1. Remove the valve core and then start to break the seal between the tyre wall and the wheel rim; if standing on it find a handhold for support; a twisted ankle at this stage is best avoided. 2. Starting on the valve side of the rim use the tyre levers to release the tyre wall from the rim. Work around the rim until one side of the tyre is free. 3. Push the valve out of the rim and . . . . . . .
4. . . . . . . . . begin to remove the tube from the wheel, gradually working, with care, each way round and remove the tube from the tyre casing. 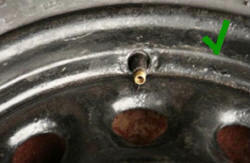 DO NOT move the tyre casing relative to the valve position in the rim. 5. The tube should now be checked for a puncture by inserting the valve core, inflating to about half pressure and testing in a bath of water. Also check the weld around the valve seating onto the tube for any damage. 6. Having located the position of the puncture in the tube check the tyre relative to the valve position, as you haven’t moved it. Is there any major damage to the tyre, especially inside which makes it unusable? Check that the rim tape on spoked wheels is sound and if damaged replace it. Depending upon the damage either repair the tube or replace with a new one. 7. Now replace the tube and ensure that it is deflated. 8. Start by putting the section of the tube containing the valve into the tyre and threading the valve through the hole in the rim. 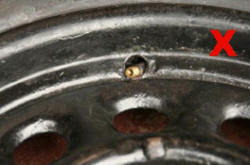 Replace the retaining nut. It is easier to feed it in without damaging it if it is folded in half as it is fed into the tyre casing. TOP TIP: At this point wipe the tyre bead on both sides with a soap solution or even Waxoil, so that the tyre will slide onto the rim. 9. Starting OPPOSITE the valve work around the tyre on both sides pushing the tyre over the rim. Check that the tube is not pinched between the tyre bead and the rim. 10. Now make sure that the valve is at a right angle and not askew, it is important to avoid stress on the seams welding the valve to the tube. Continue to inflate to required pressure and make sure that the tyre is bedded evenly around the rim by checking the line around the tyre against the rim edge. This article, written by Andrew Jarmin, appeared in CA7C Seven Focus in Nov 2015 pp10-14.